Take a little trip before the races at Turf Paradise in Phoenix to 64th Street and Greenway. There on the S/E corner of both the intersection and the shopping center you’ll think you hit an across the board favorite. Normally when I find a corner shop in a large parking lot of an even larger chain grocery store, I’m skeptical a little bit. I was told it was in the far corner of the expanse of blacktop and cars and didn’t notice the establishment at first. I parked at the earliest space which was about 30 white parking stripes away from the door and walked up to a bright yellow sign painted on the window. The crowd inside worried me at first as I waited for a friend to show up to eat and talk. I then received the confirming text, ‘Perk’. Minutes later we both were standing inside and noticed the highboy counter to our right. We asked and the friendly face at the register grabbed up two menus and seated us. The openness of the room lined with glass felt easy and relaxing. There was also patio seating and even though the weather was great we still decided to sit inside. “I’ll take,” I paused as I just realized I saw one of the menu items on Diners, Drive-ins and Dives called ‘Chicken on the Coup. The pause was awkward because almost, well not almost, every joint I have tried from the TV show’s recommendation has been unlucky. I’ve experienced only Dives. “I’ll have the pancakes and two eggs sunny side up.” I went for the staple. I kept the menu and went over it again. This eatery is beside itself in a league of tastefulness. One of the best well-rounded and easy menus to get through. I was quickly taken aback by the mantra that reads across their label. 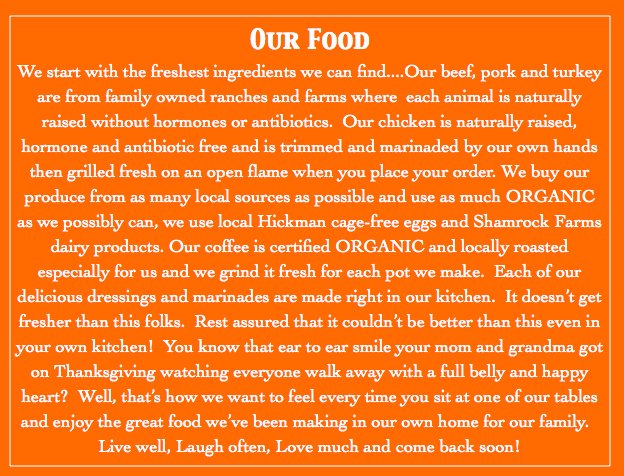 Family owned farms and ranches without hormones or antibiotics is all they use. The chickens are naturally raised. 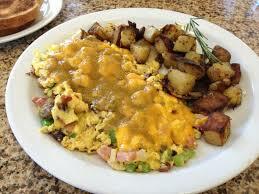 I liked the use of Hickman cage-free eggs and the coffee I was drinking was organic. The goodness just keeps going and going. We will see, I thought. ‘Been there done that’ flushed through my thoughts. I picked up the butter dish and looked at it. The cream appeared fresh and real. I smelled it and came to the same conclusion my eyes had. As I smeared the butter on the cakes, Jerry had already taken a bite and made the noise of satisfaction. My coffee was still warm and I had just made it to the color and sweetness I like when she came up to the table for a warmup. The cakes were absolutely the finest cakes there are and passing by the signature cakes you can get at Pinnacle Peak Country Store right at the wire. These were definitely a winner. The eggs were perfection. Jerry never stopped until the plate was cleaner than when they loaded on the scramble. I had just put the last mouthful in my mouth as I read the last few lines of the Perk Eatery mantra. ??????? of 4.5 Ponies, well deserved.